Radical Haredi sect takes moderate approach in missive to Education Ministry, claims mainstream haredim more extreme. 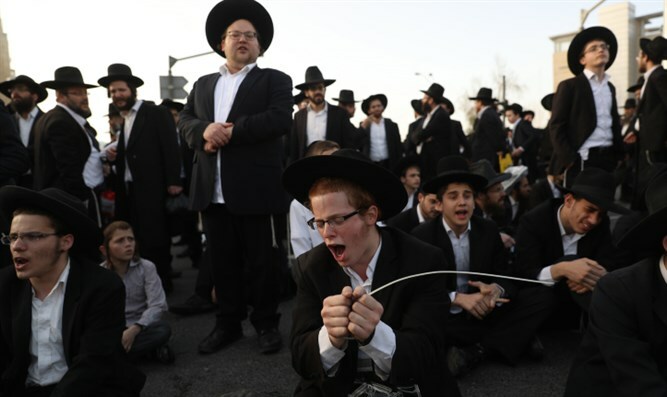 The radical haredi Peleg Yerushalmi (Jerusalem Faction) has claimed to support the State of Israel and the Zionist movement in an appeal to the Education Ministry. The extremist faction has orchestrated a series of protests and road-blocking demonstrations nationwide in recent years. Activists have demanded that the IDF exempt all haredi yeshiva students from the draft, and have encouraged supporters not to comply with draft officials – even for the securing of service deferments. Peleg Yerushalmi, which is connected with recently-deceased Rabbi Shmuel Auerbach, has also been locked in a power struggle with the mainstream haredi community ever since the death of Torah Sage Rabbi Sholom Elyashiv in 2012. Peleg Yerushalmi considered Rabbi Elyashiv's successor, Bnei Brak-based Rabbi Aharon Leib Shteinman to be an illegitimate leader, and revolted against his authority, splitting the hierarchical haredi world. Since the split, the Lithuanian-haredi world has been locked in a power struggle and the faction is responsible for violence towards policemen, IDF soldiers, and their haredi political opponents. However, the group claimed in an appeal to the Educational Ministry that it does not oppose the State of Israel and contended that their rivals in the haredi community are more extreme than they are. The letter was sent after the Education Ministry ruled that mainstream haredi schools are allowed to bar children of Peleg Yerushalmi members. According to the missive, which was first published by Behadrei Haredim, "Peleg Yerushalmi has no problem with the IDF. They vote in the elections and are not like the positions held by Meah She'arim and the haredi community." Regarding the violent anti-IDF protests, the faction admitted that "some parents took part in legal protests," but claimed that "leaders of the faction do not advocate refraining from involvement with the State and the IDF". The letter continued to say that "The faction participates in the elections, the faction has no problem with the IDF, but with forced coercion in regards to recruiting yeshiva students." The Yerushalmi Faction has been experiencing significant difficulty in enrolling their children in haredi schools. After the recent ruling by the Education Ministry upholding the informal ban by the mainstream haredi yeshivas, the group has vowed that it will petition the High Court of Justice.